Many homes in the family friendly community of Menifee, CA, were built on a concrete slab. Your home could be at risk of a slab leak developing right under your feet! L&S TurnKey Plumbing & Restoration specializes in slab leak repairs in Menifee. Our highly trained technicians will locate and repair your slab leak. We can save you money by catching leaks in their early stages. We can save you money by repairing your slab leak by repairing them quickly and correctly. A slab leak occurs when a water or sewer pipe leaks beneath the concrete foundation of your home. Such leaks may come from tiny holes, or a pipe may have corroded and broken completely apart. We use specialized, state-of-the-art equipment to pinpoint your leak. 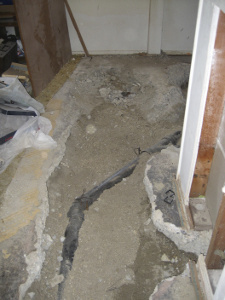 A misdiagnosed slab leak can result in unnecessary damages to your home’s foundation. Your home’s piping is subject to wear, tear and aging just like anything else. Corrosion: Older homes in this area were often equipped with copper or galvanized piping for the water lines. These materials often corrode more easily than the newer pipes that are used today. There is also sometimes a chemical reaction that occurs between the pipe, the water, and the surrounding soil that causes corrosion. However the corrosion occurs, leaks are sure to follow. Vibrations: The combination of vibrations caused by the water running through the pipe and the water temperature causing the pipe to contract or expand can cause the pipe to shift. This may result in the pipe bumping up against other pipes or hard soil, which can create cracks that begin to leak. Poor Construction: When a water line is installed incorrectly without proper insulation and good support under the slab, this can create a hazardous environment for your pipes. If too much pressure sits directly on the water line, then it causes creases in the pipe that lead to cracks and leaks. If you suspect that you may need a slab leak repair in your Menifee home, it is important that you call for professional help right away to avoid serious structural or water damage to your home. Please don’t hesitate to contact our company today, and we’ll send out a trained technician right away to verify the slab leak and speak with you about the most appropriate course of action. We’re insurance-approved and can work directly with your homeowner’s insurance in most cases. We’re available 24 hours a day, seven days of the week for your convenience.